Carrall Street, our western boundary. Photo courtesy of Evelyn. Vancouver’s Downtown Eastside (DTES) has long been infamous as the most vulnerable neighbourhood in the city with many of its residents struggling with poverty, mental illness and drug addiction. There has been extensive research done in this area and our group project’s objective was to fill in some of the existing knowledge gaps in this research and verify information about community resources. To accomplish this we used an asset-based assessment (Mathie et al., 2003) of the food resources available within this neighbourhood to answer our inquiry questions: 1) What are the food resources available to vulnerable populations and where are they located? 2) How accessible are they in terms of hours of operation, disability access, locations, signage and who they choose to serve? 3) What is the nature of the programs being offered? 4) Does the location, accessibility and programming reflect what is advertised in already-existing community food asset resources for the DTES? By focusing on the assets within the community this approach presents a positive and uplifting picture for organizations and residents of the DTES. The creation of a food asset map renders the neighbourhood more accessible to vulnerable populations. An extensive online review of available information on these food resources was the primary means to answering these questions and discovering knowledge and service gaps. These findings were then narrowed down through observation, ground-truthing and phone interviews. 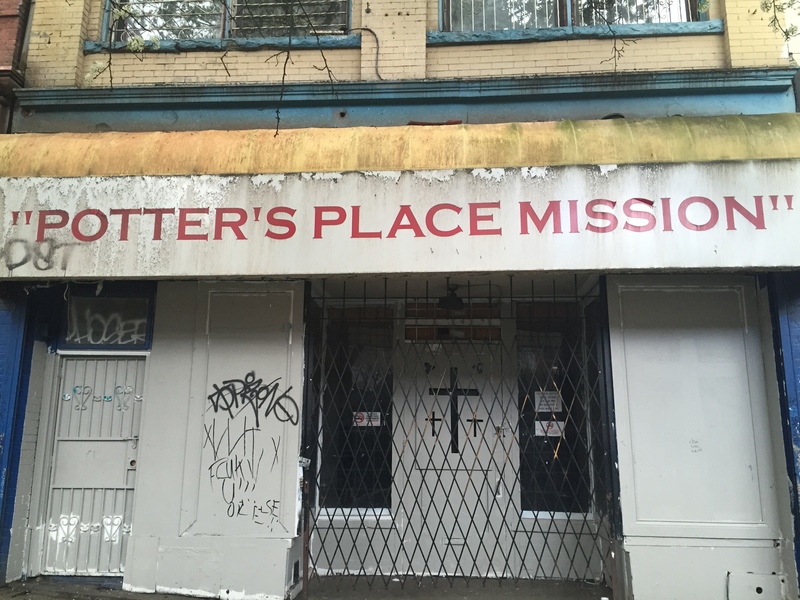 The research confirmed that a large number and variety of charitable organizations cater to vulnerable populations in the DTES with some offering additional services. We also discovered that the information currently available online about these organizations was often inaccurate and a fully researched map of the area’s free and low cost food resources was not available. In completing our research several functional gaps were discovered. They were mostly due to lack of communication, resources or the visibility of organizations, which can easily be addressed in an asset-based community. In the future our recommendations are that organizations work in concert to address potential service and knowledge gaps using the resources that already exist. Many charitable organizations individually struggle due to a lack of resources and donations which could be addressed locally. There are numerous organizations providing food for a variety of target groups which is advantageous. However, there are often several organizations assisting the same population so other groups may be missed. Overall, the DTES has many resources currently in existence that make it a good candidate for continued asset-based development. During the past week we had both positive and negative significant moments. The positive part includes visiting the community centers within our predetermined boundaries in Vancouver’s Downtown Eastside (DTES).The main purpose of this visit was to make sure that the physical addresses of the centres matched what was presented online, to check they still exist and to gather additional information about organizations.This visit to us was a turning point which relieved lots of our stress as it cleared up many uncertainties towards reaching our goal. The only negative side to this visit we felt a little bit unsafe walking down the streets and there were a lot of drunk people trying to talk to us. From our research concluded that there are definitely some gaps between these centers that can be improved with a thoughtful plan using assets that already exist. 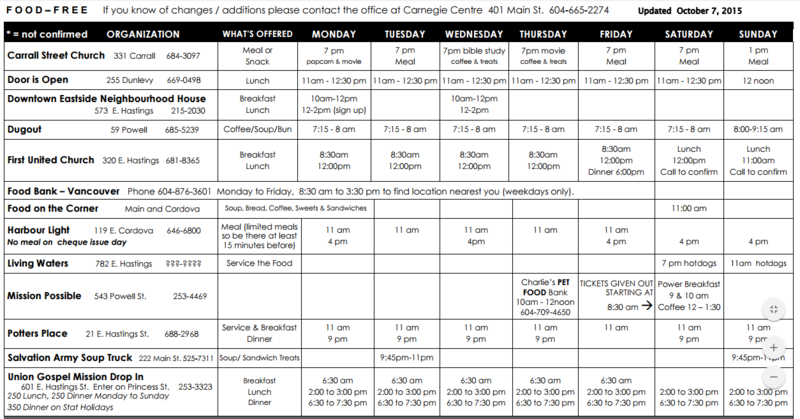 These gaps include: timing of meal operations, minimal signage and advertisement to let people know these centers exist, as well as poor food quality. Front of Potter’s Place Mission. Photo courtesy of Behnaz. Our negative significant movement started when one of groups members stopped communicating or participating in any group works. This might not seem a big concern since one might think since her work will be divided by three, it should not add up so much to our work load; however, this extra coverage was a huge setback with all the other workload from our other courses. Not being notified if our group member will participate or not until the last minutes made everything worse and more frustrating. This caused a higher level of stress, as the deadlines are just around the corner and we need to prepare for our finals as well. Even though we tried to come up with a good plan to divide up her work, we are still concerned not being able to cover her parts as perfectly due to lack of time. The importance of completing the groundwork and phone calls is that it allowed us to verify and fill in any missing information from our online research and help us obtain accurate and updated data for our map. While completing our groundwork, we did feel discomfort at times travelling on foot through the downtown eastside as only a pair. This is because the sidewalks were crowded and narrow and we sometimes had to cross the street in order to walk around large groups of people to feel safer. We feel that having an extra group member with us would have made it more comfortable as it is safer to travel in a bigger groups. With a bigger group we could also benefit from more flexibility such as scheduling more trips for footwork as different subgroups, as well as taking more time to call back some organizations for gathering more comprehensive information. Missing the help of a group member significantly affects our capacity and efficiency for gathering information via groundwork, phone calls, and online research. These are some of the negative effects that our group noticed when a member stopped communicating and participating in group work. 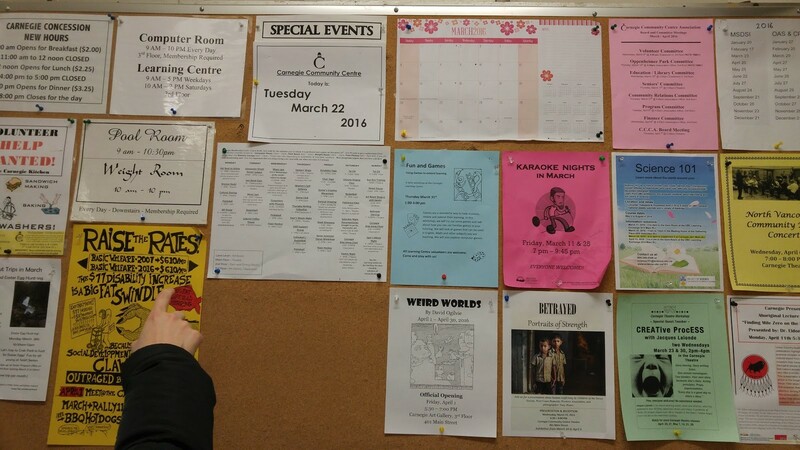 Carnegie Community Centre bulletin board of events and programs. Photo courtesy of Evelyn. We have done our best to adapt to this predicament by splitting up work as fairly as possible between the three of us. Each of us recognize that this project-based course deals a fair amount of work, and to manage it we keep ourselves organized using a series of group deadlines, which can sometimes look overwhelming. The workload may have been a contributing reason for our group member to lose motivation and vanish. However, this is precisely the reason for working together in groups, so that greater goals can be accomplished using the combined expertise of individual members (Haller, Gallagher, Weldon, & Felder, 2000). An essential factor which (Johnson, Johnson, & Smith, 1991) proposes for successful group work is to hold one another accountable for individually assigned work. When a member stops being accountable for their portion of work, the extra workload becomes particularly strenuous on the rest of the group members. This produces feelings of frustration and bitterness, which we definitely sometimes sensed. We feel that holding more frequent meetings in the early stages of our project may have helped to improve accountability, by reinforcing group cohesion and motivation. 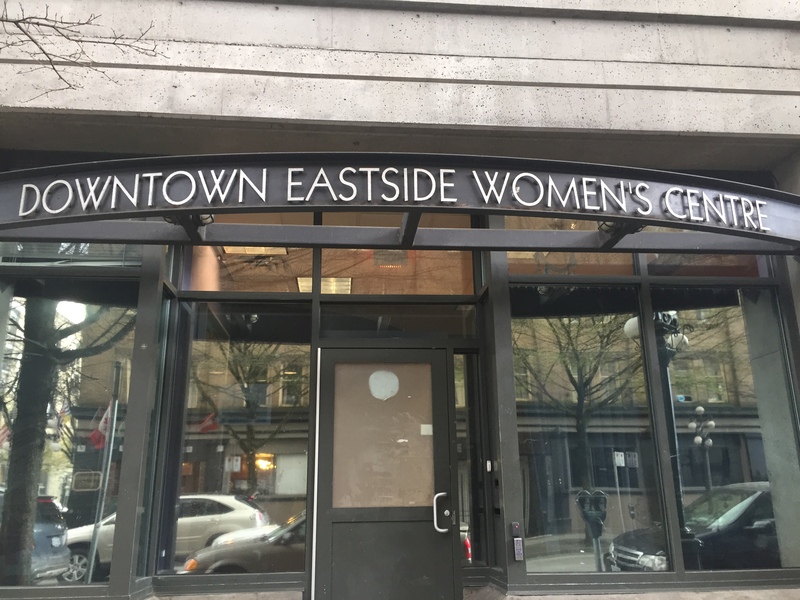 Downtown Eastside Women’s Centre Entrance. Photo courtesy of Behnaz. With our research findings we will be able to complete our project objectives and present a completed map. The broader issue involving the map is to keep it current so we will not mislead the public we are trying to assist. Continuous updating will be required, should another group take on this project next semester. A positive consequence of this action was a sense of accomplishment as a self-propelled idea was successful. The final step will be to explain our accomplishments in our final report document. In reference to our negative significant moment, we are taking a proactive approach. At the beginning we decided to maintain frequent communication between all members as well as stay organized so that deadlines were met. Now that our group has decreased by one member, these two things are even more important as is moving on to the best of our ability. With this group member not contributing or communicating came feelings of frustration, anxiety and a higher level of stress. In order not to remain trapped in frustration, we as a group had a conversation about how we were feeling and how to productively deal with the situation. After making some concrete decisions about participation and having a meeting with our teaching assistant, we moved on to resolving the situation practically. We had to act quickly in order to complete the presentation as the deadline was in a couple of days. We immediately went about splitting up the work originally assigned to the former group member, ensuring each person could handle the amount given to them. We set up another meeting before the presentation was due to make sure we were all on the same page. The same challenges will be faced for the final project report and handled through hard work and organization. The broader issues that need to be considered in completing the final report are: not overloading one person with all of the extra work and dealing with the decreased amount of time available to each of us as finals approach. Our deadlines and distribution of work will be decided as a group and open conversations will be encouraged so that if people are feeling overwhelmed, others can assist. Time management will be essential both individually and as a collective to submit our work on time while attending to our other studies. The quality of work may suffer slightly as time and now resources are limited. It is likely that our level of stress and anxiety will increase as the deadline approaches making it challenging to stay focused. While it is not necessarily effective to work at something until the last minute, this may be a challenge we have to face. It has been challenging to face this unexpected obstacle when nearing the end of our project however the remaining members are committed to producing a quality product and report. Haller, C. R., Gallagher, V. J., Weldon, T. L., Felder, R. M. (2000). Dynamics of peer education in cooperative learning workgroups. Journal of engineering education. 89(3). 285. Johnson, D. W., Johnson, R. T., and Smith, K. A. (1991). Cooperative Learning Increasing College Faculty Instructional Productivity. ASHE-ERIC Higher Education Report No. 4. Washington, D.C.: The George Washington University, School of Education and Human Development. Objective: Research housing and food sites commonly used by vulnerable people to determine what is being accessed. Achievement: Preliminary research has been completed through online resources, however we are continuing this objective in case other organizations become known to us. Achievement: The majority of our data gathering was completed through online research. We stayed focused by only answering our previously determined questions. If there were gaps or discrepancies in the information we made note of them so they can be addressed before our project is finalized. Achievement: In staying with our plan from last week, we were able to discuss and successfully meet deadlines this week. We ensured to check with group members about each individual deadline before it was set and made a concerted effort to respond promptly to any questions or communication. Achievement: While flexibility will be an ongoing process, we did achieve this in response to our ethical challenges. We adapted our project research to ensure that the majority would be publicly accessible information and those questions that will be asked are approved. In completing our Moments of Significance chart (refer to chart below), our flexibility is apparent. We have faced many ups and downs but continue to persevere. 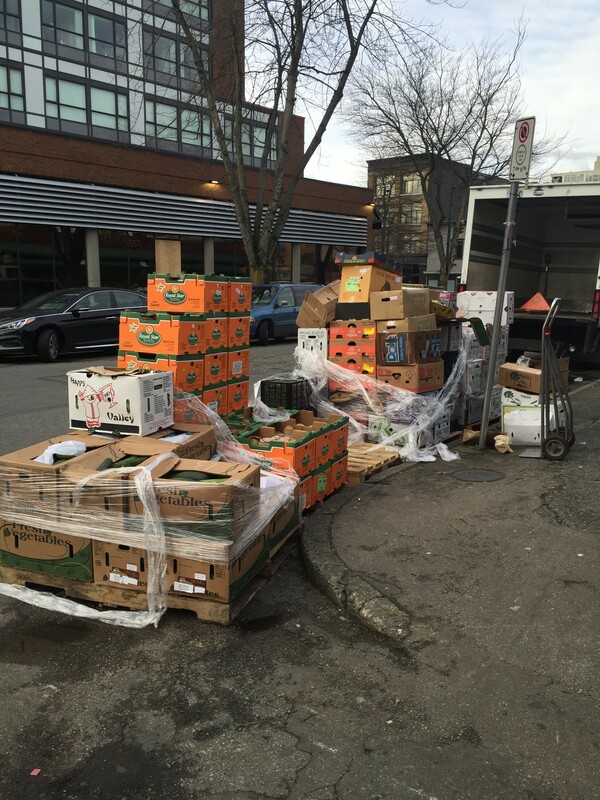 Plan: In order to verify the information that is currently accessible to the public about the food assets in the Downtown Eastside of Vancouver, we will visit the websites of the organizations listed. To address the information that cannot be found online, we will call the proprietors of those organizations with pre-approved questions about the functioning of their facility. The deadline set for verification is March 21st. 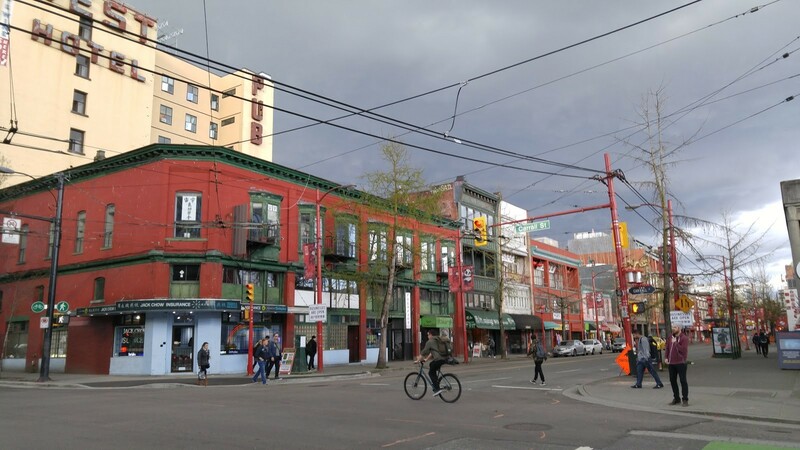 Plan: As a group we plan to physically walk around the Downtown Eastside, within our set boundaries, and see what organizations are visible from the street and confirm their addresses. To clarify, we will not be entering or observing the functioning of these organizations to ensure we do not cross ethical boundaries. We plan to complete the footwork on March 22nd. Plan: Our first step after verification of the data is to compile what we have found. From that point, we will address any gaps in the information and look for any trends that persist. 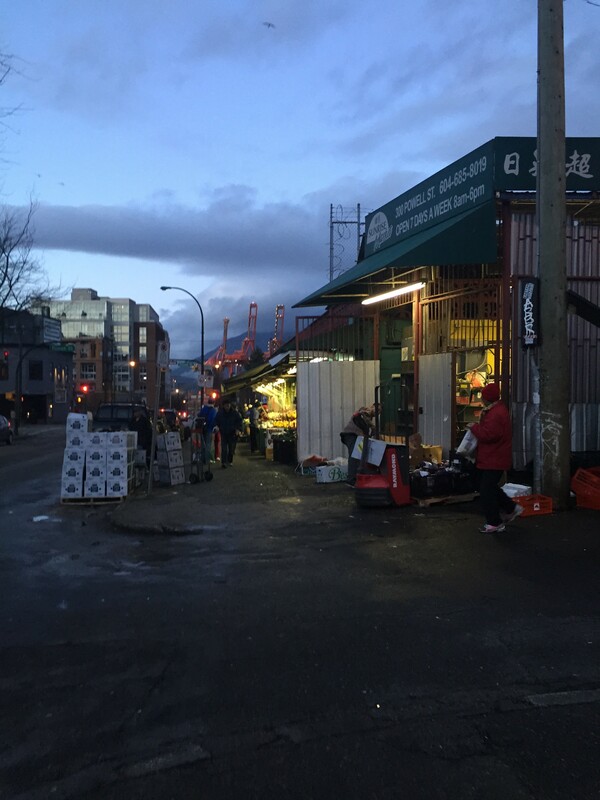 Once the information is compiled, we will begin to look into the technical aspects of creating a physical and digital map for Vancouver’s Downtown Eastside food assets. Our deadlines are somewhat flexible for this objective as it’s possible information will change after our physical walk through is complete. The workshop was an important time for reflection of our progress and also allowed us to check-in with each other’s mental states. Our group found graphing our experiences of the project to be an enlightening activity. It was interesting to find that we had all gone through similar mood changes based on common landmarks in the term. Although a surprisingly large part of our “happiness scale” fell below the halfway mark, it was comforting to know that we were all in the same boat and were able to recover from our setbacks through collaborating to come up with solutions. 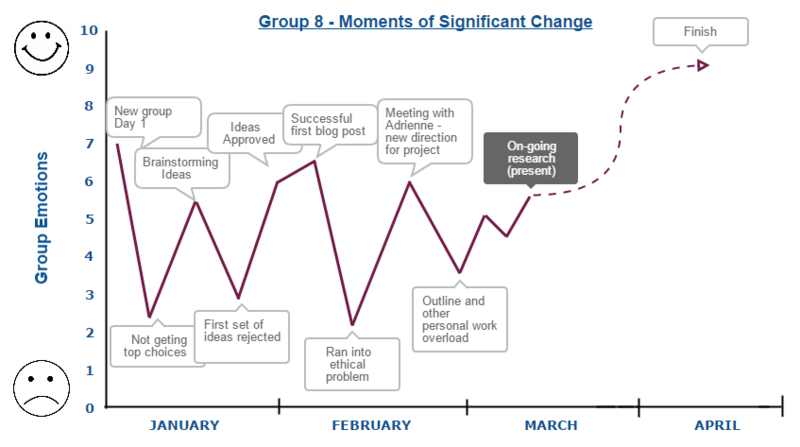 Our group sometimes encountered a problem marking the points on our graph as positive or negative because our “moments of significant change” lasted longer than a mere moment, and were often associated with fluctuating levels of emotion for each of us. In an attempt to accommodate this we added standard error bars to our graph representing our individual spreads of happiness/unhappiness at each point in time. In Figure 1, the average of our collective mindsets are shown without error bars to display the average happiness level of all of us together. Collectively our highest point in the term so far was our first landmark, the very beginning of the course, when we were all relatively optimistic about the coming term and the project possibilities. In contrast, we experienced a particularly low period when we encountered ethical problems in the components of our original plans. We overcame this difficulty by meeting with Adrienne, who provided guidance with revising certain aspects of our project to help us stay within ethical boundaries. Whether or not we have already experienced our highest or lowest points for the duration of our project, we shall not yet know. However, our levels of uncertainty have been decreasing overall throughout the project as we gained confidence in overcoming difficulties and forming specific step-by-step plans. For the time being it seems that our group’s emotions as a whole are gradually stabilizing. The next phase of our project is to compile and construct our asset map. We expect to encounter further moments of significant change as we begin to create our asset map using the research information that we have collected and our experiences with community visits. As a group we understand that the last steps of our project still contain room for unknown possibilities, which may lead to situations where uncertainty could rise again. As Lee S. Shulman describes in his article “Pedagogies of Uncertainty,” these situations of risk and anxiety are the real life circumstances we would work with in the field. They are opportunities which allow us to exercise judgement and deepen our learning experience to help us develop as strong professionals (Shulman, 2005). Our group is prepared for these circumstances and this workshop has served as a good reminder of our ability to overcome hurdles and adapt to changes. An example of a resource from which we would start our food asset research mapping. (City of Vancouver files, 2015). As a group we came to the conclusion that we need to have a concrete strategy in order to reach our final goal; providing accurate and detailed information about the areas in the current food system that have been identified in a way that vulnerable people will benefit from. Our strategies include multiple steps which we have to go through carefully and gradually in order to gather accurate information and not cross any ethical boundaries. The strategies that our group agree on include: continuing to verify information through online resources and phone calls by asking ethically approved questions, deciding on strict physical boundaries and learning about the technical aspects of building an asset map. We have also decided to gather information through observation by visiting downtown eastside in person, as a group or subgroups. We look forward to visiting the potential sites that will be featured in our resource, and we hope that these first hand observations of our environment will lend us further insight into our community’s food system. Our next step is to organize and interpret all the quantitative and qualitative data that we gather. We will then identify and finalize the relevant types of data to be included in our resource, and present the information in a convenient asset map for users. It is worth noting that none of these steps would be possible without our weekly meetings. During our meetings we clarify any concerns or questions that arise We also go over what we have accomplished so far and discuss if improvements can be made; furthermore we always talk about our next step and divide tasks so that things are done efficiently. This is how we keep each other updated and on track. We believe by following a well-designed strategy for our project and within our group we will be able to succeed at reaching our goal. City of Vancouver. (2015). Low-cost-food. [PDF]. Retrieved from http://vancouver.ca/files/cov/low-cost-food.pdf. Drug addiction, homelessness, unsafe streets; just a few descriptors that might come to mind at the mention of Vancouver’s Downtown Eastside. But through research online, our group has already found a plethora of amazing organizations offering free food within this neighbourhood. We will continue to fulfill our objectives through further research and complete our goal of compiling a detailed asset map for this diverse community! Objective: Research other assets or resource maps currently available to avoid redundancy. Achievement: Through online research, we have determined that while other food asset maps are in existence, there are none specifically labeling the organizations that offer free food in the Vancouver Downtown Eastside. As this area houses the population we are focused on, we felt it would be helpful to be able to provide detailed information about what is available. Objective: Define “assets” and “vulnerable persons”. Achievement: We defined asset as any form of free food offered whether it be a meal, snack or grocery item. Our definition of vulnerable person’s adapted to our changing perspective. It is currently people that do not have access to food on a consistent basis, including the facilities or resources to cook for themselves. The strategy behind the broad definitions is to capture as wide a range of people and food options as possible. Objective: Research Vancouver areas where vulnerable people live and create physical boundaries based on this information. Achievement: We have set the physical boundaries as north of Keefer Street and between Carrall Street and Clark Drive. To achieve this we had to remain practical, recognizing that four people can only cover a limited amount of space by foot. Within these boundaries appeared to be the highest concentration of charitable organizations offering food so we chose to focus on this area. Achievement: This is still in progress. Plan: Our information will be gathered using online resources such as websites and articles on organizations. In order to maintain efficiency, the known food assets will be divided among the group members to research. To focus our research we will be following our template of questions (Project Proposal, Appendix A) keeping in mind the gaps needing to be addressed presented in DTES Kitchen Tables article. The deadline for data gathering is March 4th. Plan: Upon reflection, we have struggled as a group to meet specific deadlines. To counteract this problem we have decided to have a group consensus on when to set them, check in with each other if an extension is needed and to monitor the google documents every couple of days to stay up-to-date. These strategies will be applied at our next meeting and continued throughout the term. Plan: As we move further into our project different perspectives have come to light. It is easy to disregard this and stay with our first plan, however we have decided to adjust our position as we go. We will be searching out more information that looks at the struggles being faced by our chosen population. We will continue to share ideas and be open to any patterns or trends that may appear in the data. One of the main areas we need to be open about is gathering data. As it will not be ethical to speak directly to people using organizations we will have to use other methods to obtain information. Maintaining flexibility will be an ongoing process throughout our project. As a group, one of the main problems we encountered was finding an appropriate population of interest and figuring out how we could assist them without crossing ethical boundaries. After discussing our topic with Adrienne and Will, we realized that we have to be very cautious and selective about how we deal with the public. Due to the sensitivity of our topic, we decided against speaking to this population in order to gain information as we are unable to predict the unintended consequences of such an interaction. Not only do we have to be flexible in gathering our data, focusing mainly on available online resources, we also faced problems finding an appropriate partner who would communicate with us and provide us with information about their organization that cannot be found publicly. Our group role as UBC community agents was to come up with an idea and a strategy to use food assets more efficiently in a way that would benefit a vulnerable population, without crossing ethical boundaries. We also had to make sure that we were working on a topic that has not been done previously, so that we can improve this subject. In order to achieve our goal, we decided to divide the tasks in a way that each of our group members can do what she is best at. Behnaz chose to be a communicator and researcher, Cailey is our editor, Claire is the writer, and Evelyn takes care of the presentation, ensuring our work looks professional. In addition, we agreed that to each be responsible for our own work and make sure that any information obtained is with ethical approval. Last week we started gathering as much public information as possible from online research. We were hoping that by the end of our research we could better decide the next steps we need to take towards our goal. This led to actions such as: defining our physical and ethical boundaries, drafting our proposal, determining our questions for potential partners and obtaining answers from online resources. A concern that came up as we were doing our research was that we did not have a community partner and as a result we had to change our perspective and create our own objectives, purpose, and steps. Furthermore, not being able to directly contact the people on the streets due to ethical reasons, we must rely solely on online information which limits and can cause a challenge in getting direct answers. We were concerned at the beginning of our project, due to the above mentioned issues, but now we feel more confident after talking to Adrienne and receiving constructive feedback. Our actions are based on identifying the food assets of our community, however, we learned that obtaining this information is associated with many ethics policies. Our new understanding is that we cannot interact directly with the public for our research. We must base our research from publicly accessible information available on websites. Broader issues of this approach include the limitations of collecting data in this manner, and how it might negatively affect the accuracy of information that we’ll be compiling in our resources. Because of this, we will have to collect our data carefully, and thoroughly verify our sources to make sure that our online websites are reliable. Because food insecurity is a very real and sensitive topic for the vulnerable population that we are interested in, it is exceedingly important to uphold the rules of ethics and exercise respect while collecting data. For example, approaching community kitchens visitors to ask about their food sources, food security, and nutritional values would be an ethics violation, even if it is done with good intentions. 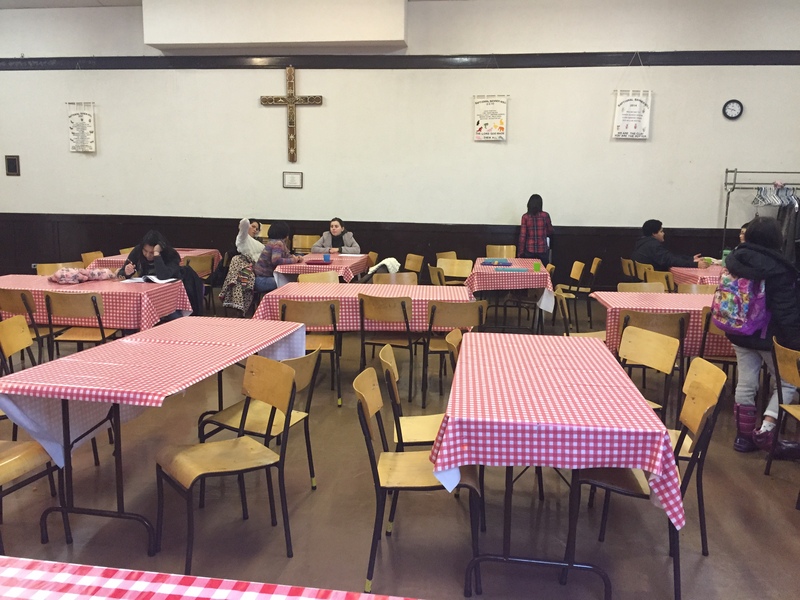 As described in the DTES Kitchen Tables Action Plan, many Downtown Eastside residents feel intimidated or humiliated when lining up to receive food (Popowich et al., 2010). Being approached and questioned by unfamiliar university students could further make these individuals feel uncomfortable and decrease their sense of empowerment. To avoid these negative effects and adhere to proper ethics, our method of collecting data have been adjusted from what we had originally planned. Now that the unethical nature of performing even informal interviews with vulnerable people has been confirmed for us, we need to shift the focus our research to on-line sources. When absolutely necessary we can conduct phone conversations with staff members of organizations if we clarify the ethics beforehand with our instructors. This change in our research parameters may actually simplify the data-collection process by removing the time-consuming aspect of legwork and interviews. However, by conducting all of our research on-line our group will be disconnected from the area of our study and the people’s direct needs. To adjust for our limited engagement in the field, we will be practicing triangulation, the second procedure for validating qualitative data as described in the article by Kodish & Gittelsohn (2011). Triangulation involves using multiple sources, which in our case will be reputable websites, to gather and confirm findings and information. For example, we will be looking for several different websites and apps that lists food assets of the DTES, we will then proceed to compare and verify the information across these multiple sources. Even so, if online sources stating addresses and hours of operation appear to be inconsistent, there is also the option of confirming information without an interview by viewing the location in person. This allows us to observe our research setting more closely and also gives us an opportunity to collect photos. As Dr. John W. Creswell explains in the video, photos allow detailed visual perspectives to be expressed, which is important for supporting our qualitative research (SAGE Publishing, 2013). Of course, our photos of the downtown eastside will never contain identifiable faces, to comply with proper ethics and to maintain respect for the privacy of individuals. In order to make this project successful, we need to justify the need for our particular map more clearly. Again this requires on-line research, but also calls for an analysis of the existing data on food assets in Vancouver to identify gaps in the knowledge that our project will address. Based on what was discussed in LFS 350 lectures, we are focusing our project on the Community Food Security (CFS) concept which is “an extension of the food security concept. [It] can be defined as all individuals in a community having access to affordable, safe, culturally appropriate, ecologically responsible and nutritionally adequate food at all times.” So far we have assumed that our map will contain valuable information on Downtown Eastside food assets, but this assumption is not adequately backed by evidence of information gaps in other projects. If we are able to validate the information covered in our map in comparison to previous data, our project will become much more valuable as Vancouver Food Strategy project and as information that can be built upon by future research. As the spring comes and the night slowly shrinks, our VFS project is beginning to bloom along with the blossom trees that line many of Vancouver’s streets. Flower metaphors aside, there is still much work to be done. Through our research we have learned about the complexity of the Downtown Eastside community, and have found ourselves uncovering more questions than we have the scope answer. We have had to adjust the parameters of our project, especially in the case of our methods, to ensure we our work is relevant and most importantly, ethical. However, we have found ways to bypass these problems by expanding our online research and are well on the way to achieving our objectives. If there’s one map that’s good to keep around, it’s one that shows us where to get food! Preferably delicious, nutritious, low-cost food. Imagine a map connecting those vulnerable in our population with the resources of our community food system. This is what our team has set out to accomplish! As students in the faculty of Land and Food Systems, we are all especially aware of issues in the food system on both global and local scales. We are enthusiastic about this creative opportunity offered by the Vancouver Food Projects, and its focus on asset-based development which sustains positive change by empowering communities from the bottom up (Mathie and Cunningham, 2003). It is worthwhile to note that practicality played a role in our project selection. We regretfully rejected many ambitious ideas due to the time frame and resources available to us. However, having settled on a reasonable project, we can proceed with relative confidence in our ability to complete our objectives. We chose to map food assets in the Downtown Eastside of Vancouver because we want to focus our efforts towards aiding some of our city’s most vulnerable people. However, in addition to our altruistic goal of helping those in need, we are also looking forward to becoming more familiar with the downtown area and building a greater connection to our city. Additionally, our group members hope this project will expose us to the reality of research in an unstructured environment. In other words, provide us practical knowledge of what to expect once we graduate and enter the workforce. We eagerly anticipate the new experience of gathering information from exploring the area and from online sources, and further, presenting this information in an accessible form for future research. Our group has a diverse set of backgrounds and interests. However all of us have done food-related volunteer work with organizations catering to less-fortunate individuals. It seems great minds do think alike. Cailey has volunteered at multiple soup kitchens which drove home her awareness of the difficulties of good nutrition and food security for those with a low income. She also observed the importance of soup kitchens as a place of community and socializing as well as a much-needed meal. 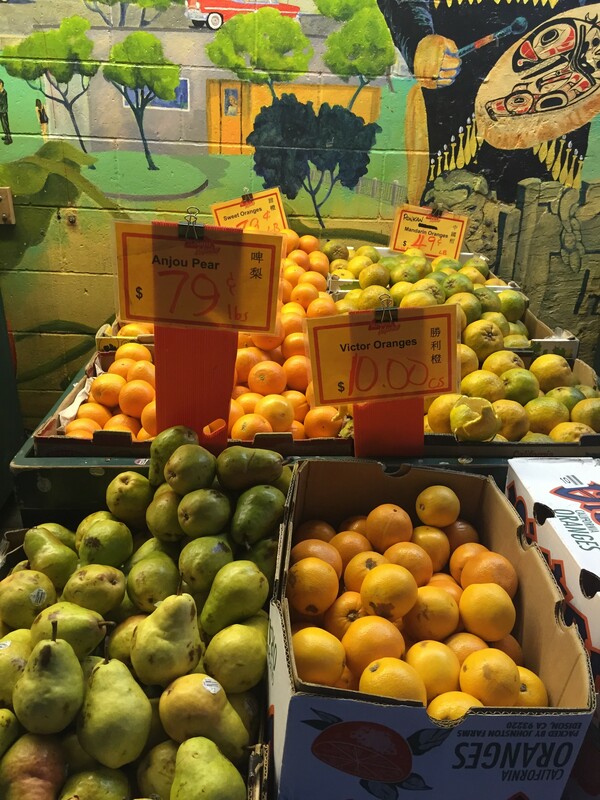 A map of Vancouver’s food assets will not only make it easier for low-income individuals to connect with available resources, but also help build a community among those individuals. Claire has also volunteered at a soup kitchen, albeit one geared specifically toward individuals with mental health issues. For her this emphasized the importance of a network of multiple assets to people unable to provide for themselves. A detailed map of food resources could expand the aid available to susceptible individuals by broadening their awareness about the surrounding community. Evelyn volunteered at a food bank where she witnessed firsthand how limited the choices were for those of low income. By mapping the food assets of Vancouver previously unknown choices will be made available, and help Vancouver’s vulnerable citizens experience a greater level of self-determination. 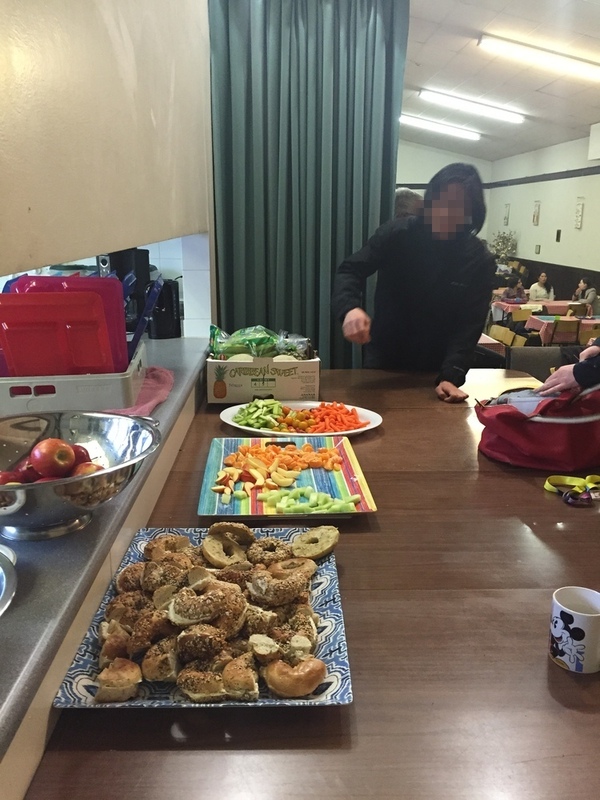 Behnaz learned about the difficulties of maintaining a healthy diet for children from low income families when she volunteered in an East Vancouver music academy, and how donations were an essential part of the organization’s functioning. A holistic map of Vancouver’s food assets will help potential donors identify where their aid will be most valuable. 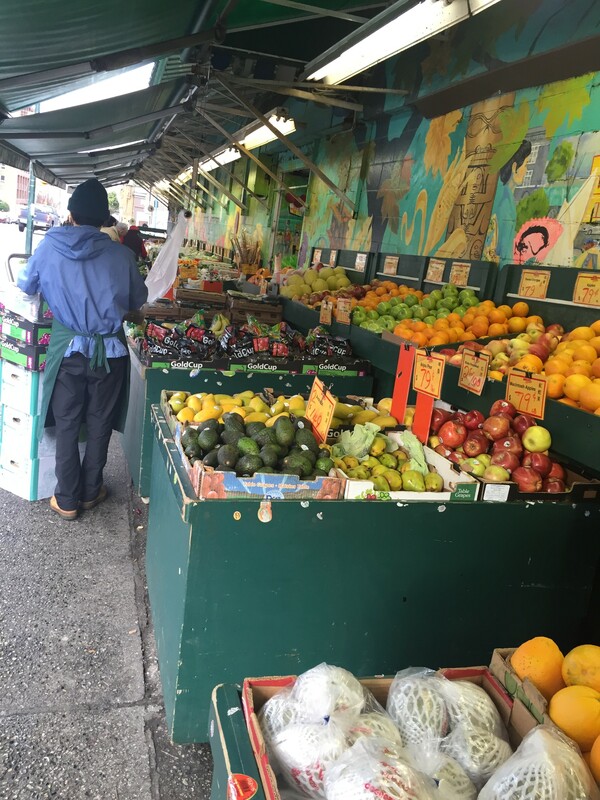 Assist the vulnerable population of the Vancouver Downtown Eastside by increasing awareness of food assets by presenting information in an accessible manner. Research other asset or resource maps currently available to avoid redundancy. We want to ensure our project is an original idea. Define “assets” and “vulnerable persons”. In order to define the boundaries of the project we need to specify the critical variables we will be focusing on. Research Vancouver areas where vulnerable people live and create physical boundaries based on this information. One of our goals is an Action Area of the Vancouver Food Strategy; Empowering Residents. We will be looking at the area frequented by vulnerable people in Vancouver and search for meal opportunities within the vicinity. This will ideally provide a greater perspective on the variety of options available for people to eat. Research housing and food sites commonly used by vulnerable people to determine what is being accessed. This objective fits into the Vancouver Food Strategy Priority Focus on food accessibility. They want to “address gaps in local food processing, storage and distribution” (Poole et al, 2013) and we are specifically looking at distribution and accessibility. As a group, we were looking forward to taking on the challenge of completing a Vancouver Food Project! Initially we faced some apprehension about the assignment, as the possibilities seemed endless. We had many discussions and ideas filter through our group before we came up with one that was feasible, accessible to us as students and important to a portion of the Vancouver population. As we started to learn more about the assignment, we realized that we had the ability to tailor the project to our collective interests. As stated in the introduction, we share a passion for working with those who are underprivileged and we truly believe that being passionate about an idea will make all the difference and as such we were clear on the group we wanted to work with. In his TED Talk, Want to help someone? Shut up and Listen!, Ernesto Sirolli emphasizes on the need for active listening as the first and most imperative step in identifying how to help a person. As part of our food asset project we want to exercise active listening with our community. We believe that the perspectives of our stakeholders; the organizations and people who influence and run community assets, are vital in designing our project. We want to avoid appearing as though our project is there to fix something that is wrong, but instead, collaboratively identify opportunities for improvement. We intend to build upon and strengthen people’s knowledge, accessibility and self-determination using the social capital they already have. By building on community’s social capacity, we also aim to enhance community engagement and active citizenship encouraging the individuals to make their own food choices. As stated by Alison Mathie and Gord Cunningham (2003), “Asset-based Community Development has the potential to encourage active citizenship in the sense of citizen-to-citizen ties, while simultaneously strengthening the capacity of people as citizens to claim their rights of access to assets on which they depend for their livelihood” (p. 475). They also argue that developing a community using resources already present and thereby, will bring communities together. Both of these ideas the main basis of our project. We intend to encourage community engagement and map out currently existing food assets, instead of looking at the need in the community, and in doing so, strengthen the sense of citizenship and empower individuals in their food choices.